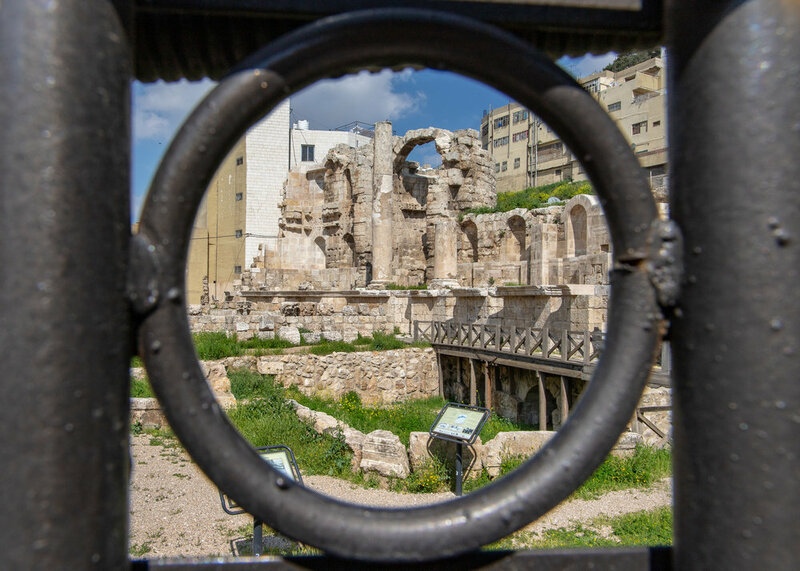 Dating back some 6,500 years, Amman is seriously old. As befits such an ancient city, it has known a number of civilisations over the ensuing years. Called Rabbath Ammon in the 13th century BC by the Ammonites, its name was changed to Philadelphia (Greek for brotherly love) by Ptolemy II Philadelphus, who occupied and rebuilt the city in the 3rd century BC. Fast forwarding 2,300 years to the beginning of the 20th century, barely 1,000 people lived here, yet today it is home to some 4 million inhabitants, a significant proportion of whom are immigrants and refugees and who give this bustling yet friendly city a distinctive flavour. 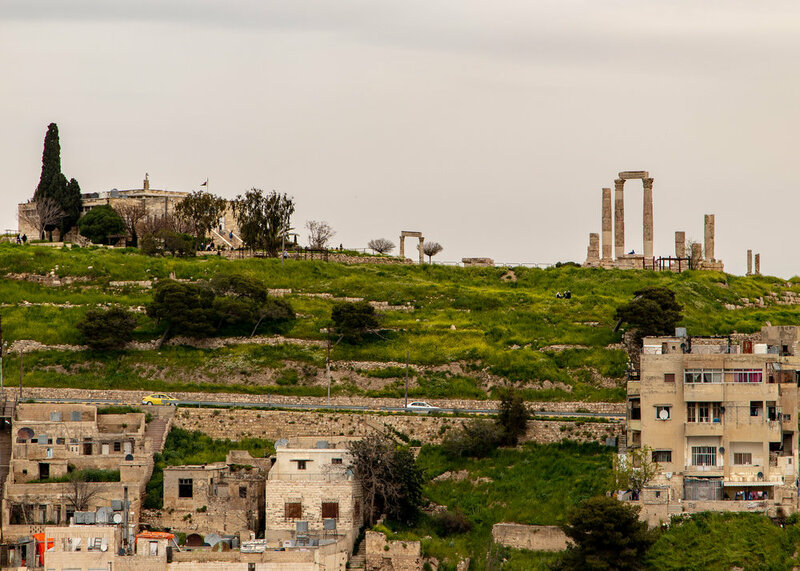 With five days to spend in the city, we have ample opportunity to get a good look around at what Amman has to offer and its no exaggeration to say that the longer we’ve been here, the more we’ve enjoyed it. What immediately comes to mind is how super friendly the people are. In fact, I’m going to go out on a limb here and say that the locals here are the friendliest we’ve ever met. And, as we get to explore the nooks and crannies, we’re always coming across super cool things which confirms that this city is definitely underrated. 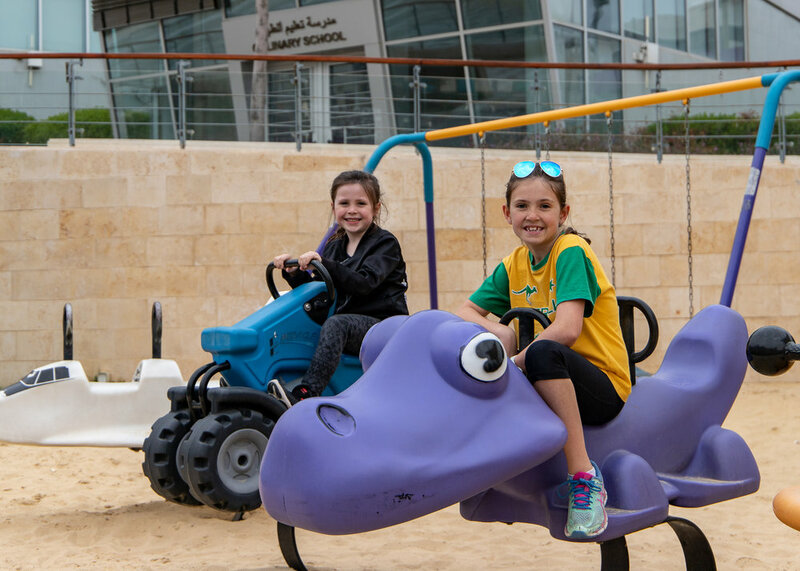 Our first full day was spent at the Children’s Museum which is situated inside King Hussein Park (between the Royal Automobile Museum and the King Hussein Mosque). 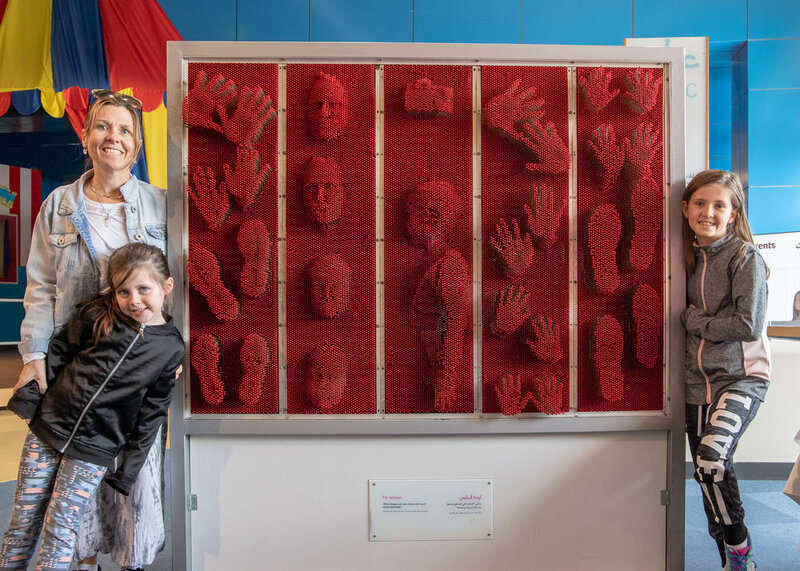 This is a cool interactive museum that Emmy and Annabelle loved. There’s nothing over the top with it and for our mind, its success is down to the simplicity of the exhibits. 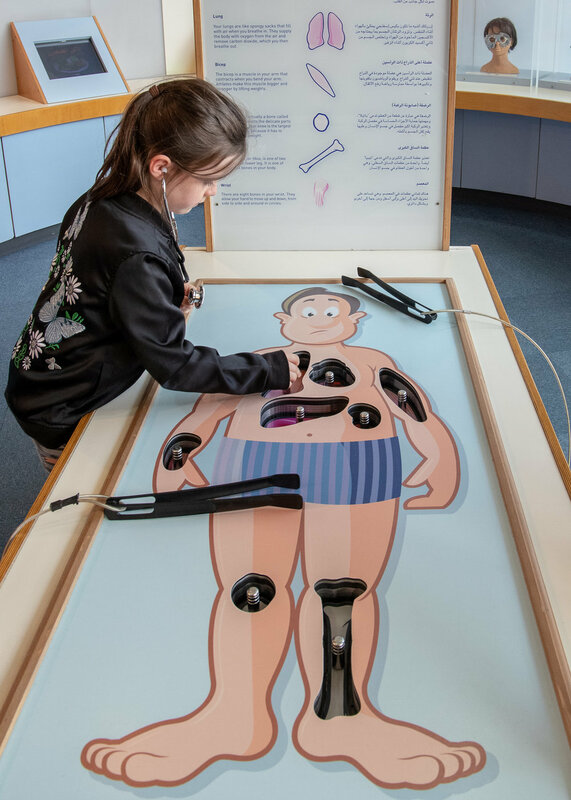 For the kids (and slightly bigger kids), there’s plenty of opportunities to try out new skills and decide what future occupation might be in store. Operation…. you’re the doctor, got the patient on the run, operation…..
My favourites was the ability to make our own money. I’d never thought I’d have my face printed on a 50 JD note, but at the Children’s Museum, this and a whole heap of other things are more than possible. Rainbow Street is one of the places in Amman to come to eat. A cobbled street with funky cafes and knick-knack shops galore, this was one of Veronica’s fav places to visit. Most likely, she would’ve enjoyed it a whole lot more had I not been there and we had room for her to buy any number of great little trinkets, but thankfully, I mean unfortunately, we didn’t! Amman not only is old, but it is damned hilly. Built on a total of 19 hills you’re guaranteed a workout if you do any amount of walking. As PE teacher for the entirety of our trip, I’m always keen to incorporate a good walk in our day, which has the added benefit of coming across all sorts of cool sights. I’m not so sure the pupils are always so keen but hopefully as the trip progresses, we’ll all get a bit fitter! Descending the stairs at the bottom of Rainbow Street, we wandered through downtown Amman before checking out the exterior of the Grand al-Husseini Mosque (or King Hussein Mosque depending on who you ask, even though there is another mosque with that name). 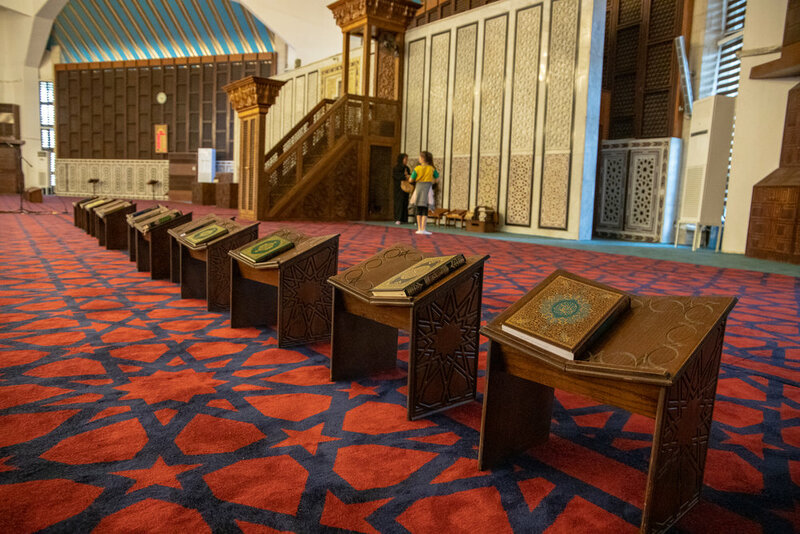 The mosque was built in 1924 by the emir Abdullah bin al-Hussein and is situated in the heart of the gold souk, but being a Friday afternoon, the street was heaving and with tiring kids, we didn’t want to chance it too much by taking them inside. Instead, we took a short stroll to the Numphaeum, a partially preserved Roman public fountain. It was closed, so we weren’t able to get up close and personal, but what we could see from the outside was still pretty cool. The following day we thought it was time to have another kids activity day, seeing how the previous outing had worked out quite well for everyone. After the obligatory walk (footnote - Amman really isn’t a city designed for pedestrians, but never let that get in your way), we arrived at the Haya Culture Centre. I’d researched this place previously and thought it’d be fun for everyone. 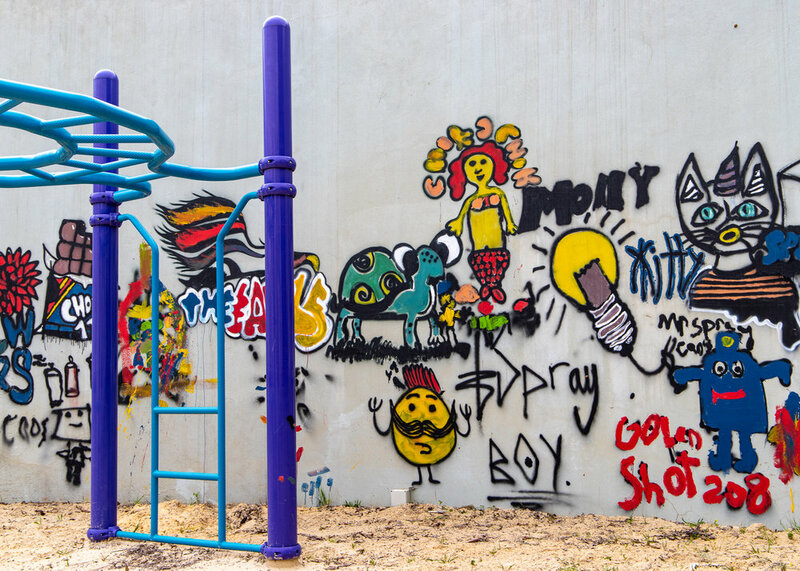 However, this one had fail written all over it, as beyond the playground there was scant else to do to justify the 2 JD entry fee. Or so I thought. When asking the kids what was their favourite part of the day they vigourously opted for the Haya Culture Centre and its playground. Just shows, so long as kids have somewhere to be kids, all will be fine. 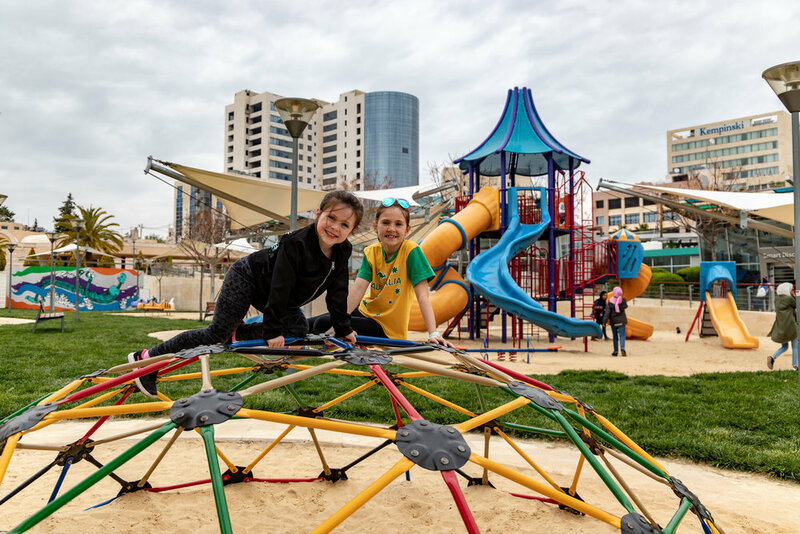 I wouldn’t encourage anyone to go out of there way to visit, but it wasn’t too far from our accommodation and with few places for kids to be kids, it ended up being a lot better than we initially thought. Someone wanting to be the centre of attention, as usual! 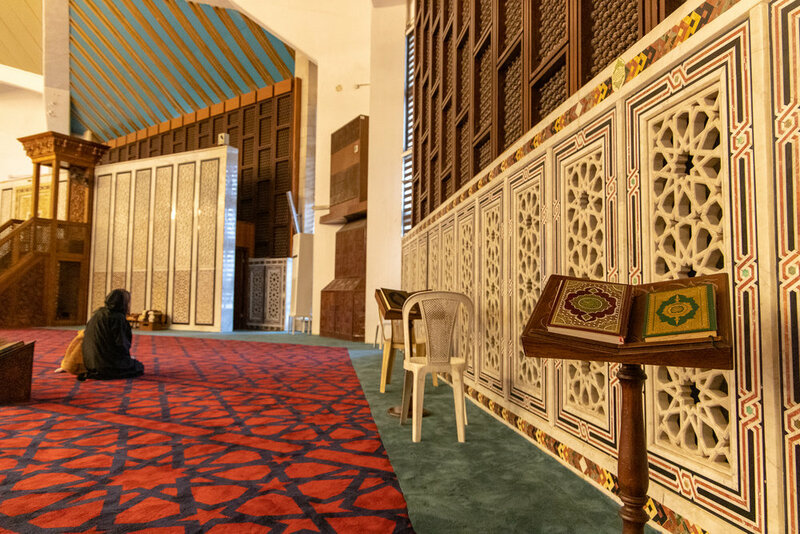 Situated less than 100 metres from our accommodation (the quality of which warrants its own post and is coming next) is the King Abdullah I Mosque. Built in the 1980’s it is easily recognisable by its beautiful blue mosaic dome which no doubt attracts the faithful from miles around. Tourists are allowed to visit with a small fee of 2 JD per adult. As you’d expect entering a place of worship, you are required to dress conservatively which means long trousers for men, whilst women are provided with an abaya to cover their heads, arms and legs free of charge. At this point I’m sure Veronica wishes she’d kept and packed her abaya, as the borrowed one wasn’t quite as trendy as that which she’d previously owned.. In order to get into the Mosque, there is a separate tourist entry gate, from which everyone goes through a shop and then the women pick up their abayas before paying the entry fee at the top of the stairs. There is a gentle “come buy my shop” both when picking up the abaya and when dropping it off, but its all pretty harmless and the shop itself does have some interesting items on display. You are allowed to enter inside the mosque outside prayer times from where you can view the interior. Veronica had spent some time with the kids teaching them about mosques and they loved going inside and putting their learning to practise. In the case of Emmy, possibly too much learning, as she started praying in Islamic fashion by pressing her forehead to the ground (called (Sujūd). The sad thing was that I didn’t want anyone to take offence, so I asked her to stop, even though we all knew that there was absolutely no intent of her doing that. During our entire visit, we always felt free to wander and look around, both inside the mosque and outside. There was the occasional praying visitor, but again, we never felt like we were intruding and thoroughly enjoyed our visit. That wraps up our first four or so days in Amman. We’ve saved the city’s highlights (the visit to the Roman Ampitheatre and Citadel) for the last day as the Jordan Pass which we purchased gives us free touristic sites entry over a 14 day period, in addition to waiver of the Visa entry fee, and to get the most out of it we need to start it as late as possible. 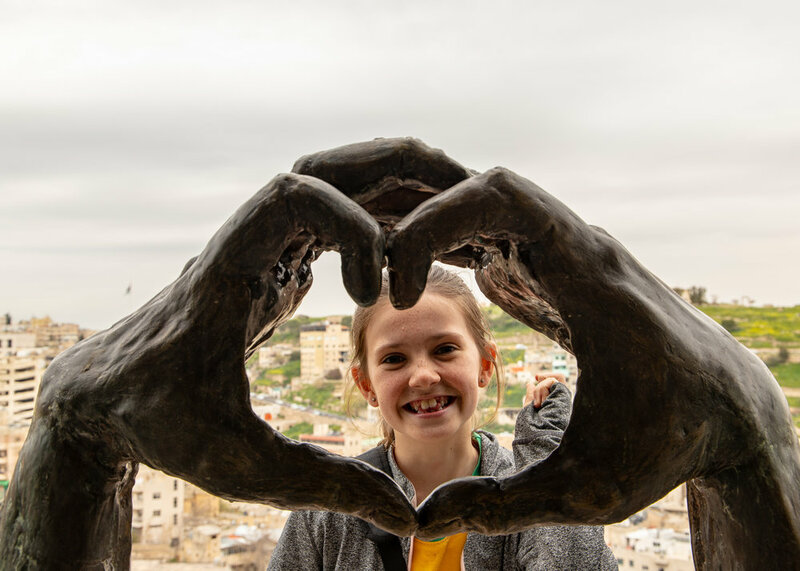 If you’re interested in how we make our Kiwi peso (dollar) stretch further, make sure you check out the next post on the accommodation we stayed at whilst in Amman.